This boat is a 1 owner and is in mint condition options on the boat are: Snap in carpet, full vinyl flooring, fish station, live well, heavy duty rub rail, reclining captains chair, big couch, sun deck with changing area, 4 upgraded fishing swivel chairs, console seat with backrest, AM/FM stereo with CD player/4 speakers, LED Bimini Top, Ski Tow bar,Trolling motor with dual batteries, Fish finder, full boat cover. The boat also includes a 24 ft dual axle trailer that is also in mint condition. The boat interior and exterior is in perfect like new condition with low hours on the boat and motor. 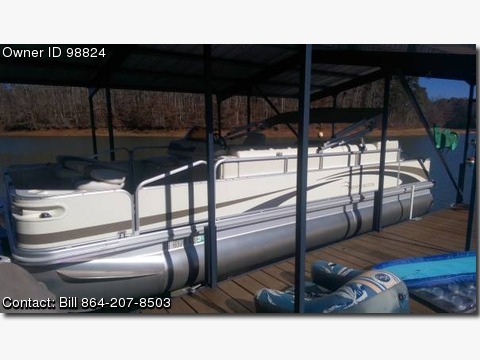 Call or text Bill @ 864-207-8503 Low retail price is $21,000 to high retail $24,000 with out trolling motor. You will not find a nicer boat.